Cheadle Hulme will be filled with the sound of laughter on Friday 12th October when we return to for yet another of Manchester Rugby Club‘s fine, fine comedy evenings! Tom Houghton is a natural comic talent. He is also a fully paid up member of the British upper class. His father ran the entire UK armed forces and he currently lives in The Tower of London! 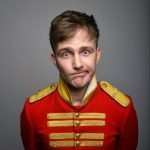 Funny and charming, with roguish tales and hilarious songs, Tom Houghton is a star on the rise. 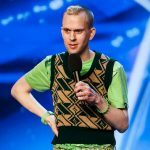 2018 Britain’s Got talent runner up Robert White is the only gay, Aspergic, quarter-Welsh comic on the British comedy circuit. Known for his brilliant timing and performance style, Robert’s chaotic stage presence, improvisational skills and delivery won him the 2010 Malcolm Hardee Award for Comic Originality. In the same year, he wrote one of Dave’s Top Ten Jokes of The Fringe. Salford’s very own Jamie Hutchinson and MC Karen Bayley complete another excellent evening! Fully licensed bar. Non members welcome. Ample free parking. Wheelchair access. Please note – We want all our guests to have a great night so we ask you to turn off your mobile and not to chat when the acts are on stage. Anyone deemed to be spoiling the enjoyment of others will be asked to leave without refund. As comedians material is their own copyright any form of video or audio recording is strictly forbidden.